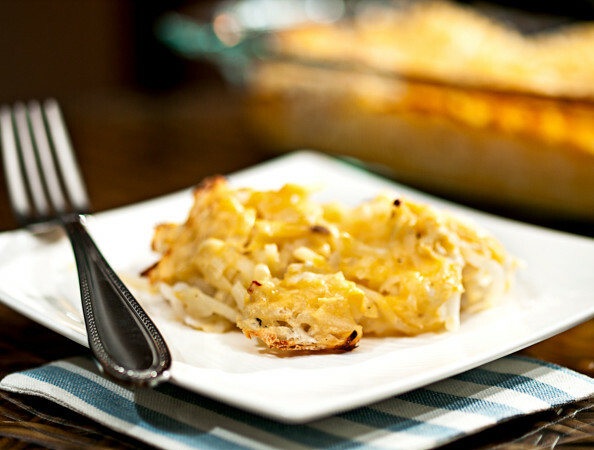 A cheesy potato casserole is a holiday favorite for many families. However, this dish is typically loaded with calories, fat, and carbohydrates. This healthier version of potato casserole will save you several hundred calories and several grams of fat. Coat a 13 x 9-inch pan with cooking spray. Spread hash browns on bottom of pan. In a large nonstick skillet, melt margarine over medium-high heat. Add onion and sauté until clear. Add remaining ingredients and mix well. Cook about 5 minutes, stirring occasionally. Pour soup mixture over hash browns. Bake for 50-60 minutes.